You may not be a gamer, but it’s unlikely that you play no games. Flash and social networking have even converted moms that once scolded children for playing too much Mario into people that care about virtual farms and cafes. Smartphones and tablets have also given more people access to casual gaming, especially since many of those devices run on Android, an open source OS that anyone can develop apps for. Still, console games are where most gamers spend their gaming time. There are many debated reasons for this, but the clear ones are: ergonomic controllers, consistent graphics, and they work on the TV. Whether you love it or hate it, for decades the TV has been the entertainment hub of the modern household, so it’s always felt the appropriate place for gaming. The downside to consoles is game development; it’s an extremely competitive market, so there’s little room for the indie developers that have a great game idea but lack the millions of dollars to get it onto a console. Well a year ago there was a campaign started on Kickstarter to address that problem, and almost $9 million later, the OUYA was born. OUYA is an open source gaming console that runs on Android 4.0, and its purpose is to bring indie games to the TV. The official launch is in June, but lots of early backers just had theirs shipped to them. 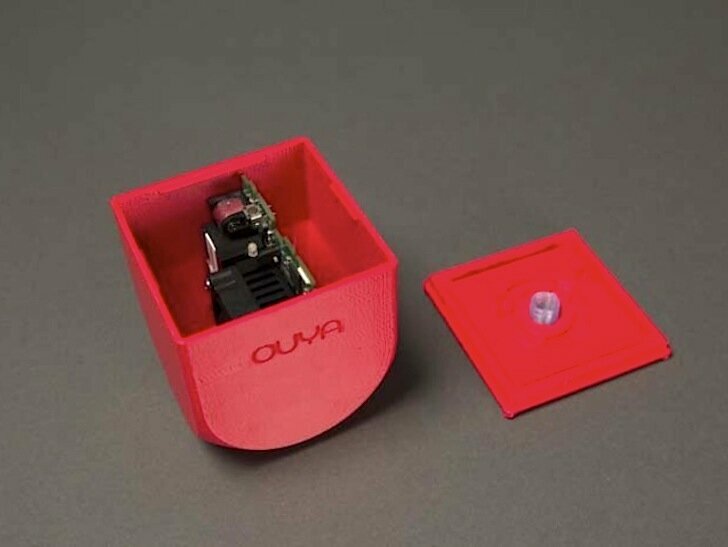 To really highlight the open source nature of the OUYA though, the developers gave the case files to MakerBot to be converted into 3D printable files, so now the case is completely customizable. Of course MakerBot put the files on Thingiverse, and they’re available in .stl and .3dm, so you can modify as you please. The files include the main enclosure, lid, and a spring button. What’s really neat about this is that besides just being able to print your OUYA in whatever color you like, you can also print it in the shape that you like, so it can match your entertainment system or double as a rack to hold the controllers. Or it can be the Batman emblem. I suspect that there will soon be a Customizer version of this. I also suspect that we’ll see more companies separating the electronics from enclosures, giving users more freedom to 3D print them in their desired dimensions. This is where open source and shrinking electronics really synergize with 3D printing, as they allow people to truly customize the experience of a device, and not just to their taste, but also to their specific activity; the electronics of an OUYA could easily be placed into an enclosure with a built-in screen and speaker system for a bus trip, and then later moved to a slim enclosure to take to a friend’s house. The possibilities really are endless.